It is official, the WNBA New York Liberty have been sold. However, the Ladies of Liberty will still play their 2019 season at the Westchester County Center. On Jan. 23, it was announced by WNBA Interim President Mark Tatum that the purchase of the NY Liberty by Joe Tsai and his family was unanimously approved by the WNBA and the NBA Board of Governors. “We are fortunate to welcome Joe Tsai to the WNBA family at a pivotal time for our league. We thank Jim Dolan and the Madison Square Garden Company for their incredible support of the WNBA the past 22 years and for their commitment to finding the right owner for the Liberty,” stated Tatum. Tsai is a minority owner (49%) of the Brooklyn Nets and the owner of the San Diego Seals, an expansion franchise in the National Lacrosse League. Tsai is also a founder of the lucrative Alibaba Group, a China-based global technology company with businesses in e-commerce. He is the Vice Chairman of the Alibaba Group and has remained on its Board of Directors since the company was founded in 1999. “It is an honor and privilege to join the Liberty and the WNBA families,” said Tsai. “The Liberty and the WNBA exemplify what it means to compete at the highest level, serve as role models in the local community and bring greater opportunities to female athletes,” continued Tsai. Therefore, after 21 years as residents of Madison Square Garden and one year after moving the WNBA franchise to the Westchester County Center in White Plains, the Liberty will soon be calling Brooklyn their home. 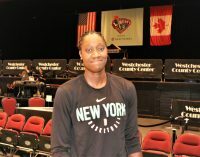 The Liberty will open their 23rd season in the WNBA with their Home Opener against the Indiana Fever, on Friday, May 24, at the Westchester County Center. The Westchester County Center will remain the home arena of The Ladies of Liberty throughout the remainder of the 2019 season. The Liberty’s final regular season home game at the County Center will be played against the Fever, on Friday, September 6. The NY Liberty will be introduced to Brooklyn fans when they host a Comm-UNITY Day, while celebrating community, diversity and inclusion at a to-be-announced game at the Barclays Center this summer. “As the proud owner of the Liberty for 22 years, we are pleased that Joe Tsai will now guide the franchise with a commitment to serving its loyal and passionate fans in New York. We will always be Liberty fans and extend Joe and the entire WNBA our best wishes for future success,” said Jim Dolan, Executive Chairman and CEO of the Madison Square Garden Company, who was the last original owner of a WNBA franchise.